Did taking a Cleveland Brown pay off? Yes and No. Did the Cleveland Browns lose in Week 3? Yes and Yes. 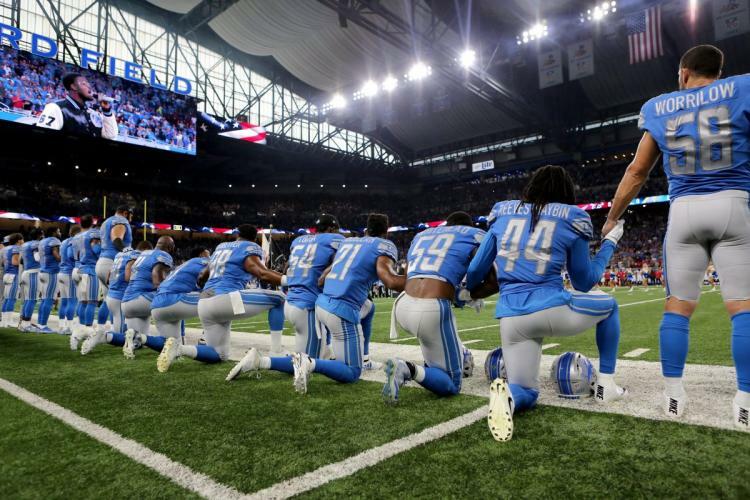 Before we get into the results of this week’s NFL Sleeper Cell League, We, the writers at 3 Up, 3 Down, would like to address the peaceful protests that have been taking place during the National Anthem both this weekend and throughout last season. We here at 3 Up, 3 Down support any Americans right to free speech, as well as, the American right to peacefully affect social change and raise awareness in a manner that they feel is most impactful. 3 Up, 3 Down is made up of a group of writers who exercise their right to free speech on a daily basis, so to look down on others who are doing the same would be hypocritical. If raising your voice for something you believe in is un-American, then we’ve lost what has made this country so great. We here at 3 Up, 3 Down stand with the players of the NFL, and we do it proudly. However, while we applaud the NFL owners and teams for standing in unity and solidarity with each other against the president’s ad hominem attack on private citizens, we also hope the NFL owners can look past the perceived questions of patriotism and disrespect to the flag, and start standing in solidarity with the reasons Colin Kaepernick and Eric Reid kneeled in the first place. A great op-ed by Reid can be found here. Out of love for our country and in honor of the sacrifices made on our behalf, we unite to oppose those that would deny our most basic freedoms. We remain committed to continuing to work towards equality and justice for all. Since it’s about sleepers, we’re going to take the DraftKings ownership percentage and subtract that amount of points. For example, if you select Drew Brees as your pick and he scored 50 points, but his ownership is at 50%, you’ll only score 25. If your Running Back, Wide Reciever, Tight End, or Defense’s ownership is under 5%, your points will multiply 5% is multiplied by 1.5, 4% by 2, 3% by 3, 2% by 4, 1% by 5, and less than 1% by 6. For Quarterbacks, the multipliers are halved, 4% by 1.25, 3% by 1.5, 2% by 2, 1% by 2.5, and less than 1% by 3. At the end of the season, the top 2 writers with the most points will split a $100 prize pool $75/$25. In the words of Jake, “Britt always seems to be good for a handful of big games every year.” Well guess who struck gold at the right moment! Kenny Britt didn’t exactly go off, but as far as low ownership misdirects go, this one is pretty good. Britt ended the day with the second most receiving yards on the team. 4 catches for 54 yards, with one of those four for a TD, is a solid Sunday for a Draftkings lineup. Especially since the Browns decided to spread the wealth around, busting out a big play would give you that fantasy advantage. Britt’s 38 yard-snag was a thing of beauty, and then Britt made a tip-toe catch for his lone TD of the game. The interesting thing to watch moving forward is how often the Browns will now throw to Britt. If he’s able to get around defenders like he did on his 38-yard catch and his 10 yard TD grab, they should be going to Britt more often. I’d keep my eye on him moving forward. Rashard Higgins was the biggest bust of the week. With a 21.9% ownership and a measly 3 points, that came from 2 catches for 10 yards. What’s more interesting is that he was targeted 50% less than the week before, which is something to take note of. With Coleman out for the foreseeable future, who is going to be the top receiver for the Browns? It was Higgins in Week 2, but he was al but non-existant in Week 3. When posting this week’s picks on Reddit, there was a user who claimed that none of these players were sleepers, with the exception of Duke Johnson. Well, I disagree with that person, but they were right about one thing: Duke Johnson was indeed THE sleeper for week 3. With everyone’s attention drawn to Higgins on the Draftkings boards, Johnson was able to step up and have a big game and an unfathomably low ownership. Johnson performed like a top-tier running, as well as a top-tier receiving back, and against a Colts defense that has been pretty rough this season. Will this be the new gameplane for the Browns? When in doubt Kizer legs it out, tosses it short ot Johnson or long bombs it to Britt? Can that get them a W? Danny Amendola once again reprised his role as the highest paid decoy in the NFL on Sunday against the Texans. C.J. Anderson. Got stuffed. All Day. The Buffalo Bills are now tied with the New England Patriots of the AFC East, which is a sentence I rarely write or even thought about. The bruising running style of Anderson was met with resistance by the Buffalo line, which makes it no surprise that the agile Jamaal Charles out rushed him and saw more touches. While this pick is against the experts and against the rankings, it doesn’t hurt to be different. However, in Week 3, it did. I’m honestly shocked that Jackson’s ownership wasn’t higher than this. I mean, 9.7% ownership for a guy who had monstrous upside? 9.7% ownership for a guy who has getting looks downfield on a team that also has Mike Evans? I’m not saying DeSean Jackson is a must play, but for me he’s close. The upside is so worth it. DeSean every week for me, please. So the Bengals are still going with their three-headed issue in the backfield, but they are trending towards using Joe Mixon more than Hill or Bernard. However, Bernard got the goal line score, on one of his 2 targets out of the backfield. With Andy Dalton struggling to make plays perhaps it’s time to look at the inconsistency of his package personnel. I don’t hate this pick, but personally, if I’m going with a Packers wideout, it’s going to be Randall Cobb. While Adams is almost always a bargain at his price, he’s the best bargain option out there most weeks. I would much rather pay for Cobb and his lower ownership than roll with Adams. However, it was Geronimo Allison who took off and really went to town on the Bengals defense, racking up 120 yards on 6 receptions. Neither Allison nor Adams saw the end zone, but Jordy Nelson did… twice. While Green Bay has a solid receiver corps, I don’t see any one of them being a viable sleeper option moving forward. It’s boom or bust or Nelson. It’s just not worth the roll of the dice to me. Jared Cook was the only Oakland Raider to make it out of Sunday night with any semblance of a fantasy performance. Seriously. What an atrocious showing by Oakland. Just absolutely manhandled by Washington last Sunday. Woof. Cook had the most receiving yards on the Raiders offense, but in the game, he had only the 4th most yards receiving. Literally, four Washington players had more yards receiving. I mean, what a night for Washington, and what a game to forget for Oakland. Woof. Check in next Saturday to see all of our picks for Week 4!